Many bats just don’t get enough space in the blogsphere–and the 2015 Anderson Flex BBCOR is one of them. We reviewed this bat late last year and lumped it in with the youth 2.0 Techzilla bat. But we thought it deserved some publicity on its own. We aren’t the only ones to have information about the Flex. Other places, in particular those who sell bats, usually have a boiler plate write up on the specs of a bat. Many of those we reference to make sure we are seeing what we should be. Here are some more references for the 2015 Anderson Flex review. The BBCOR Flex is a single walled aluminum bat. This gives the bat a fantastically low swing weight. This bat is securely in the hand-weighted category with the Rawling’s Velo and DeMarini’s CF7 trailing in swing weight. This light swing weight should play well with highschoolers looking for a single piece stick with a lot of ring on the hands. 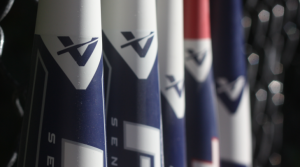 The single-walled BBCOR flex also gives the bat noticable pop and a ping off the barrel when you find its sweet spot. In the right hands it can really drive the ball in the gaps. Smaller hitters trying to find a bat they can get some distance and batted ball speed with should find some satisfaction with new iteration from the Anderson name.